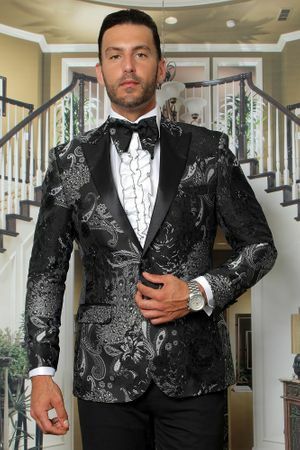 If you need a fancy fitted tuxedo style jacket with a modern fit, let Manzini take your style to the next level. Slim fit blazers and jackets are all the rage and their collection of jackets have the Celebrity look that you see on the Red Carpet and award shows. This black floral fitted jacket has the black satin lapels with side vents in a modern fit.